In 1860 Kushog Lake was called Kakwakshebemahgog on some maps and Kahshahgahwige-mog on the survey. This is Ojibwa meaning “that which doesn’t run straight, with a lot of narrows where you can see through or beyond.” The following year it appeared on maps as Cushog and Kushog – both spellings were used. The next year it appeared as Hall’s Lake. Probably Kushog is a corruption or slang version of these longer names. It has had many other names over the years including Cushog, Koo-Shog and Kaskagawigamag. 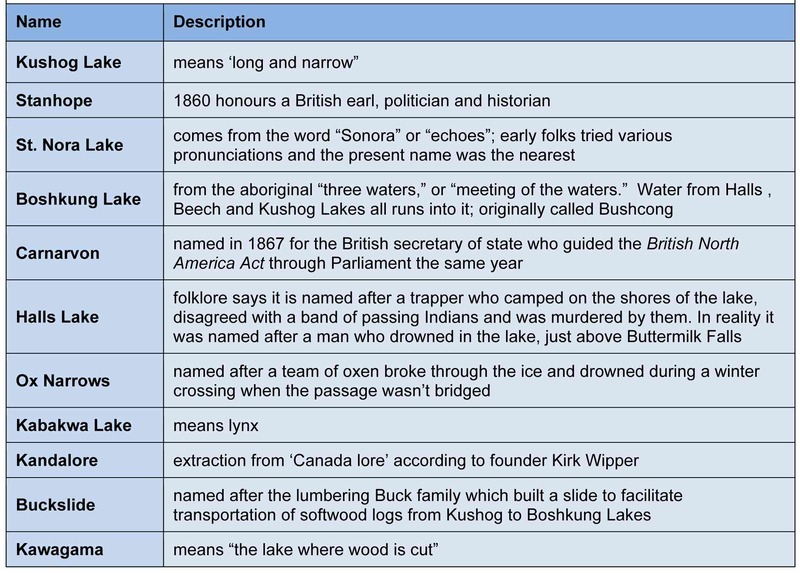 One early cottager called it Kushogabogawigamog. The north basin (north of Ox Narrows) was considered a separate lake known as Kashagawi Lake, until the 1940s, and what is now called The Firehouse Restaurant was named Kashagawi Snack Bar when it was built by Johnny Broderick in 1950.